It was a fun Sunday I had last week, meeting my girls again over a decade. Nah, not really a decade, but it's been quite a while since last time we met. I also met some other new faces, well, it's always exciting making new friends. 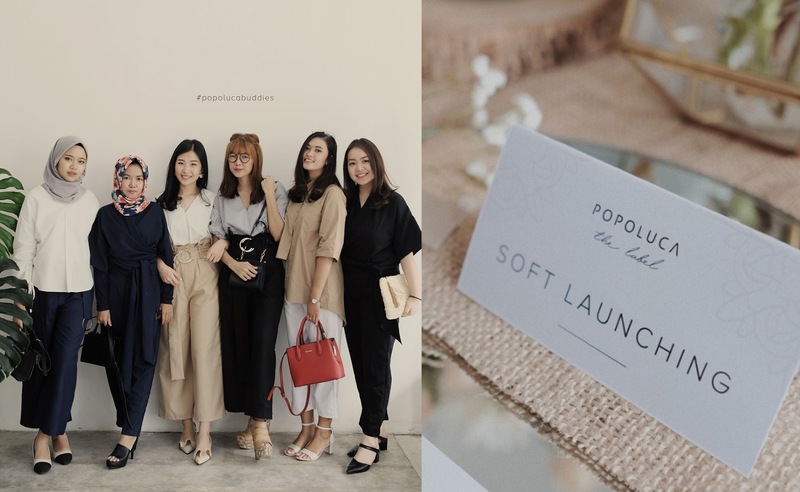 We were invited to the rustic themed brunch of the Soft Launching POPOLUCA The Label, which is a local ready-to-wear clothing label based in Yogyakarta, perhaps some of you have already known them. 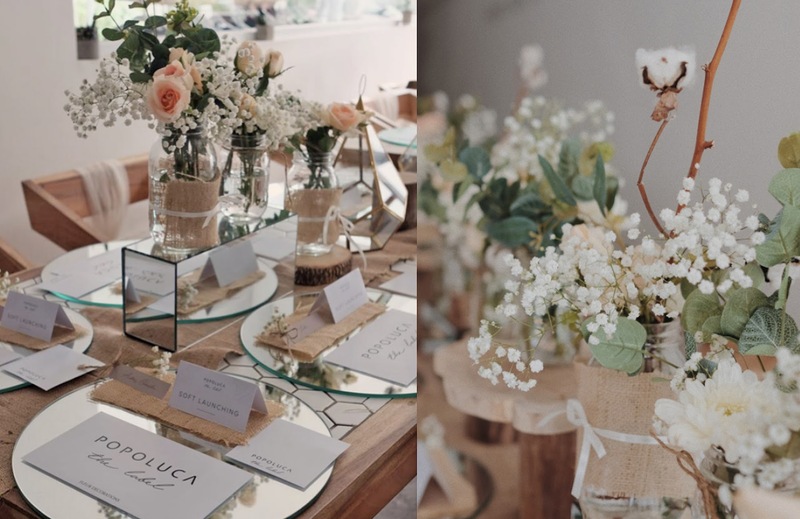 I'm not gonna write much in this post (I promise), I'm just gonna tell you more through pictures, so you can just enjoy these photographs, this pretty...pretty...decorations they have, attention to details, and to some fragile but beautiful meal tray made of glass which is my favorite part, such a picturesque arrangement! 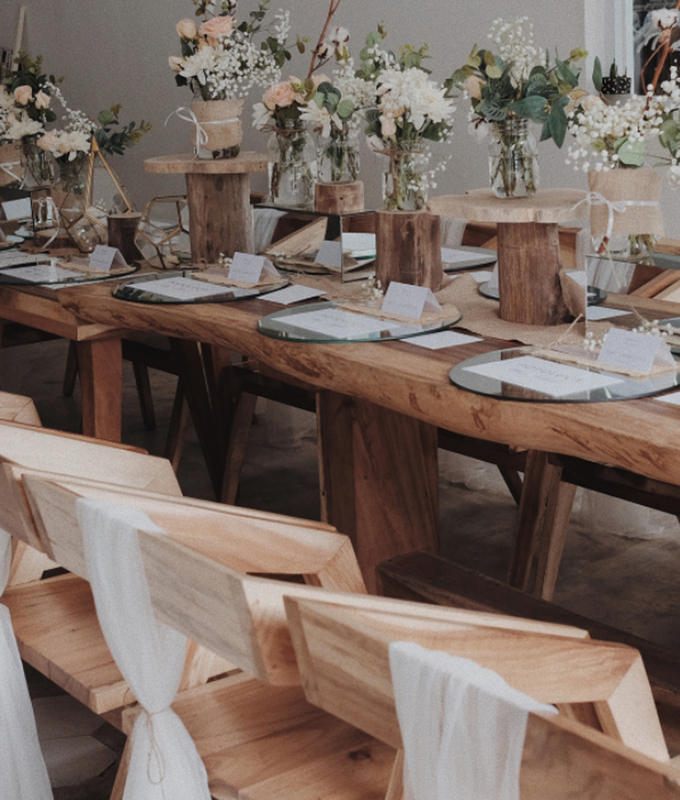 Looking at these pictures now making me feel like I was attending an outdoor wedding reception, in the middle of pine woods, chilling with the birds, kissed by the sunshine piercing through the trees, and it's raining, and thank god I'm not drenched since I'm actually under the roof, I promised not to write much, but here I am doing it. It's been a while since I post in english, I miss it, please bear with me. The invitation says to be present at 9 a.m. but Sunday makes it hard to go early. Not because I woke up late, but for me, Sunday morning time is for chores, dishes and laundry heaps await, so, I tried my best to leave at 9.30 and arrived at 10 a.m. sharp. 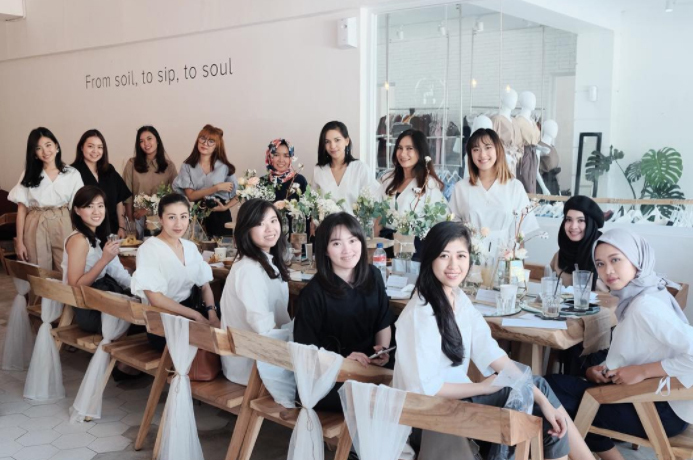 Most were there already but it's actually just a casual chit chat to each other about the new collection and the label's new concept, I did asked a lot about online business, hihi. The venue is not too far from my house, and it's actually right next to the POPOLUCA store itself, it's Hayati Specialty Coffee, basically, both are in the same building. 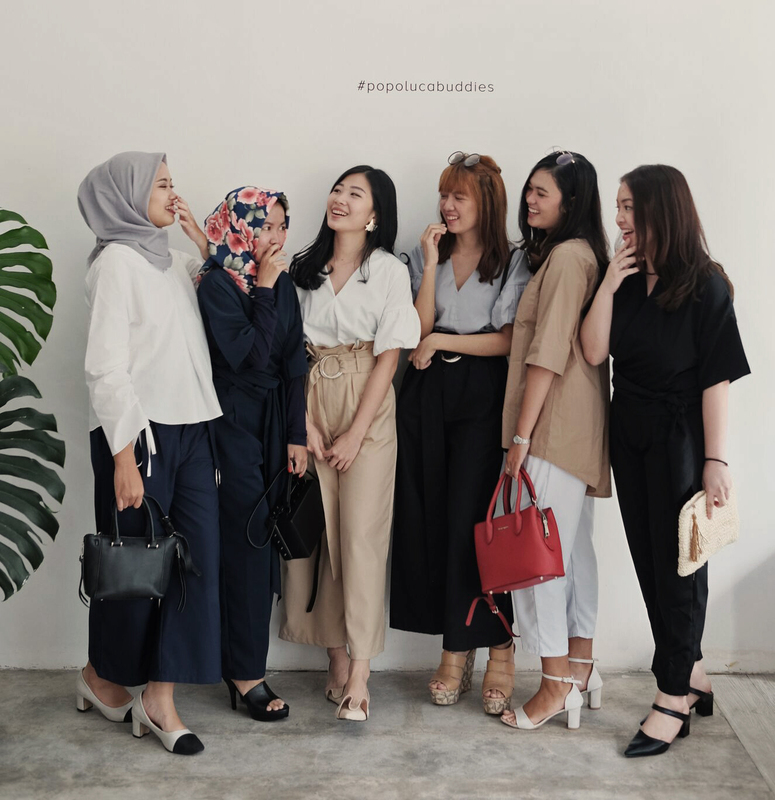 So, POPOLUCA has been around since 2012 selling only dreamcatchers online, becoming a company, and growing even bigger offers a much more various items such watches, accessories and most importantly, the stylish yet affordable clothing label. 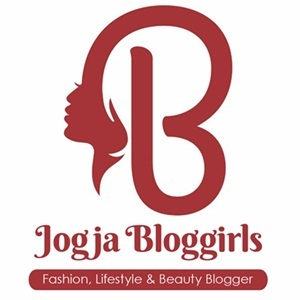 Now, they run their very own store at Jl. Demangan, Yogyakarta. 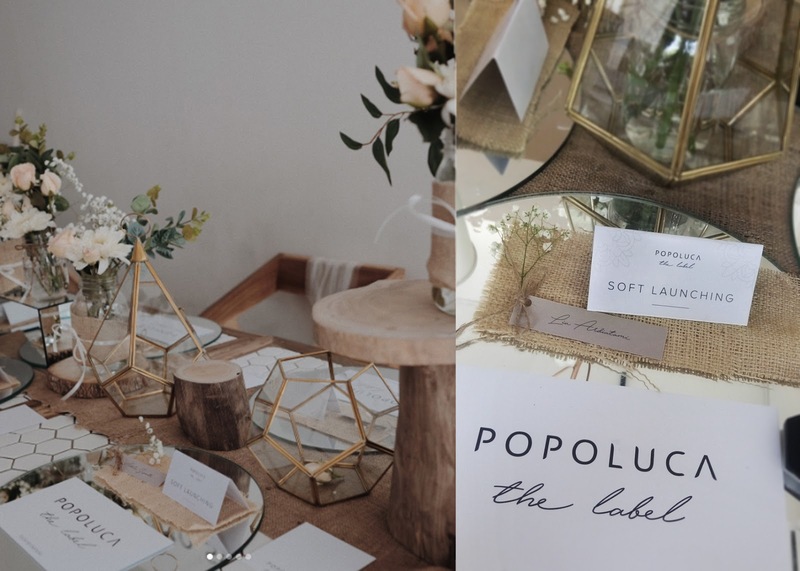 Before, they're not producing clothing items on their own, but the clothing label now becoming 'POPOLUCA The Label' and the new collection 'Down to Earth' is their first in-house production items self-designed by POPOLUCA. The new collection is a casual chic style with subtle representations of neutral shades and earthy tones (I got this from their Instagram, haha) and few days before the event, we were asked to pick two items from the collection to wear on the upcoming event. 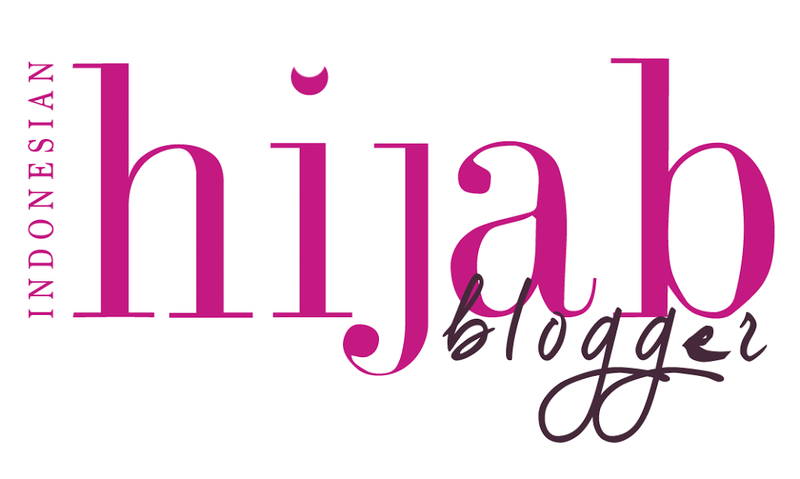 So, these items below are some of the new collection, my choices, I love how they also make modest designs. 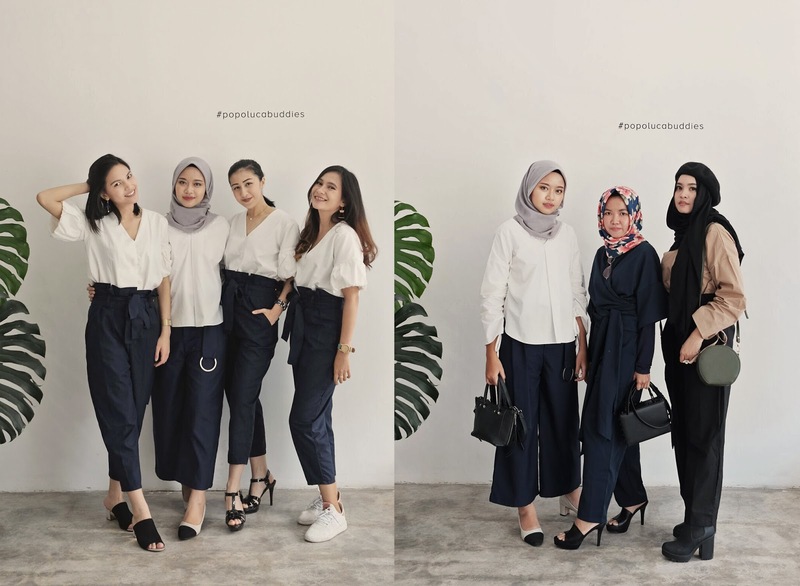 It's kinda tricky to style a non-hijabi items to an appropriate hijab outfit for a sunny Sunday, but, challenge accepted, see how I style them below! 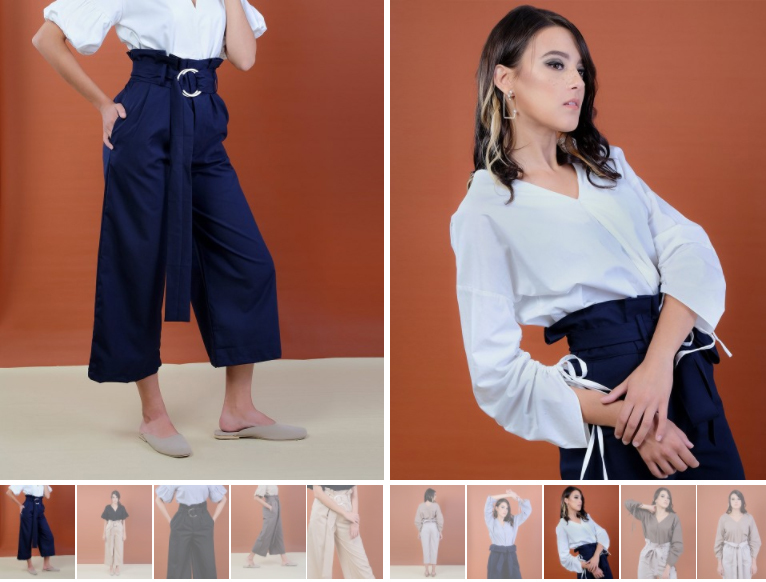 I picked out two items; Volcano Belt Wide Leg Pants in navy, and Soil Gathered Sleeved Top in white, all below IDR 180,000 can you believe that? I chose much warmer tone such as brown and olive green initially, but some of them were gone unavailable, so, I pick ones that are likely fit better for sunny day, white top to release heat, and navy pants, me just wanting to wear something dark underneath because it's classic and looking like anak SMP (Indonesian Junior High School Uniform), but hey, looking SMP is good news, lol. Here's moi with POPOLUCA's new collection 'Down to Earth'. 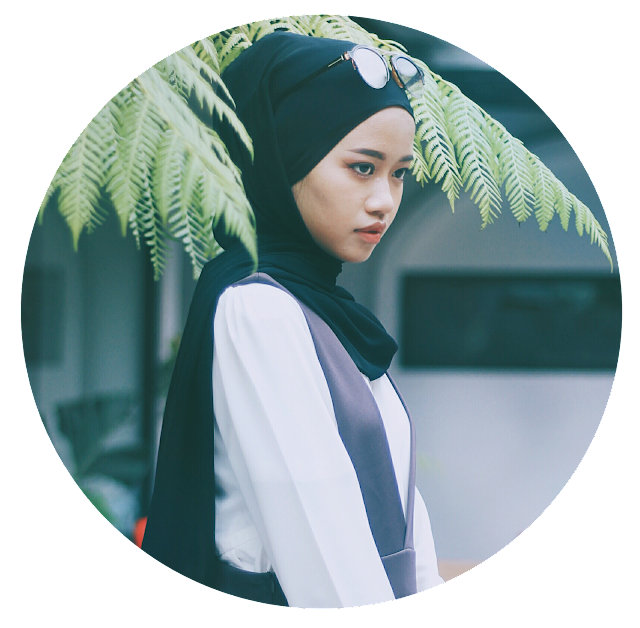 I created an easy semi-formal look since it's a brunch invitation. The belt supposed to be tied on the belly and styled high waisted. 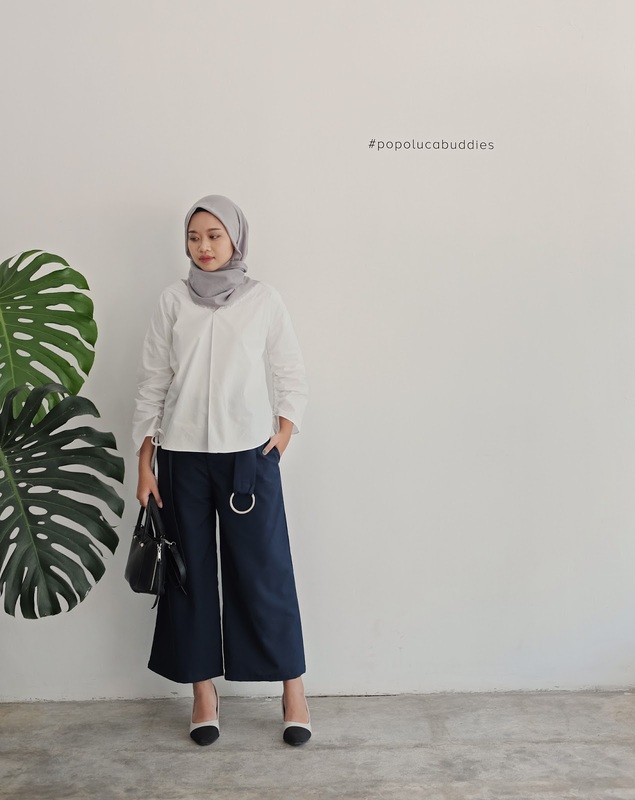 But, I did it differently since I wear hijab, and for this wide top I feel more comfortable wearing it tucked off, but not leaving the ring details of the belt, just leave it be hanging in front and it turns out kinda work! no need to accessorize much. Later when I have kids, I can just make them grab onto the ring and follow me around.........................gurl, bad idea. Black mini handbag and a simple plain scarf also added to the look. I'm styling the scarf a bit loose and pin it on the side to give a more fresh look to the face, no stuffy or squeezy since it's hot and sunny. Finished up with my current favorite midi block heels with black toe cap giving the semi-formal yet dynamic feel, block heels made easy to walk, and last, a smile! Giving you some more glimpse on the deco, and the last session of course, making memories. We take turns doing OOTDs, group shot, selfie, groupfie, flatlays, whatever, we're just saving these good moments of us in pictures. These are more of my new friends! Thank you to POPOLUCA for having me, thank you cici darling Amel and her bf Wijaya for answering my questions, and for hosting such a great event. Wish you both a great success always! Dekornya baguuuus... Aku suka style km yang ini li!